The essays in this volume explore the relationship between morality and various kinds of motivation. Most people have a strong intuition that there is a relationship between morality and motivation: to be virtuous requires not only that we do the right thing but also that we do it for the right reason. In fact, we are often willing to excuse someone who did the wrong thing, if they did it for the right reason. A person’s characteristic motivations are part of what we call “moral character.” It matters for moral character whether a person is responding to incentives, seeking praise, avoiding blame, being guided by a sense of guilt or responsibility, and so on. The focus of this discussion will be a comparison of two very different types of motivation: incentives and praise. This may be surprising. It is very commonly believed that praise is actually just one form of incentive. Incentives are extrinsic motivations. They induce people to act by offering something desirable that is not intrinsic to the activity itself. In this respect, there seems to be no difference between a bonus, a prize (which could be considered a form of praise), and the approval and admiration of other people. My aim is to show that this way of thinking about the problem obscures crucial differences between incentives and praise. The concern will be to compare them, not with respect to their efficacy in affecting behavior, but particularly with respect to morality. There has been a growing body of scholarship demonstrating the problematic relationship between incentives and morality. Bruno Frey, for example, has argued that the self-regarding considerations involved in responding to incentives can “crowd out” other-regarding, altruistic considerations (1997, 1998). By now, there is a large body of research, both in economics and in psychology, showing that incentives tend to “backfire” when people experience them either as an insult to their autonomy or as an insult to their values (Deci and Ryan 1985; Fehr and Falk 2001; Grant 2012, 114–115, 129–131). Incentives can threaten both personal and social or political virtues. I will argue here that there is another kind of motivation—praise—that is different from incentives in crucial respects. While incentives can threaten virtue, praise plays a critical role in its development. Obviously, if praise is simply categorized as a form of incentive, this very important difference between them cannot come to light. My argument is not new. Perhaps surprisingly, it can be found in the writings of John Locke and also Adam Smith. It can be found in contemporary psychology as well. I will discuss each of these accounts in turn. But first, I want to begin by tracing the development of the concept of incentives. This is the first step to gain clarity on the meaning of the concept. “Incentives” has come to be a term that is used so broadly that it encompasses every kind of motivation. But incentives are one kind of motivation with quite distinct characteristics. Most people think that the concept of incentives arose as part of the development of ideas about market economies in the seventeenth and eighteenth centuries.1 But in fact, with very few exceptions, the term does not appear in the writings of John Locke, Adam Smith, David Hume, Jeremy Bentham, James Mill, John Stuart Mill, or the authors of the Federalist Papers. The term, “incentives,” gains in popularity in the early twentieth century, particularly in the USA, and undergoes a shift in meaning at the same time.2 The concept became important in the context of debates over socialism, scientific management of industrial production—sometimes called “Taylorism”—and, most important for my purposes here, behavioral psychology. Frederick Taylor published The Principles of Scientific Management in 1911. John Broadus Watson began publishing his theory of behaviorism in 1913. This is right around the time that the graph shows the beginnings of a dramatic increase in the use of the term. Behaviorism explains human behavior as adaptations to stimuli in the environment. There are no instincts or other internal sources of motivation—no intrinsic motivations. Human beings are passive, reactive, and malleable. Their behavior can be shaped by manipulating external stimuli—or incentives. Behavioral psychologists became interested in how incentives could be used to motivate learning, and they coined the term “incentive motivation.” There is a close affinity between these ideas and the ideas behind Taylor’s use of incentives for social engineering in industrial production. People will change their behavior in response to external stimuli. Scientific management is the knowledge of how to design incentives so that factory workers will be more productive. The psychological assumptions of behaviorism still shape our understanding of incentives—particularly the view that incentives are the only kind of motivation. As a result, we no longer see the wide variety of motivations at work in our lives—a child goes into the yard to dig a hole out of curiosity; people care for a sick relative out of love or sense of duty or both; an African-American child is inspired to pursue a political career by the example of Barack Obama, and of course, to be inspired is not the same as to be incentivized. Examples could be easily multiplied. We even have a new verb, “to incentivize”—I just used it—which is replacing “to motivate.” The graphs below show how new this term is and how quickly its use is growing, while to “motivate” is beginning to decline in usage at the same time. The problem is that “incentivizing” is a much narrower idea than “motivating.” Imagine a meeting where a policy direction is set and the question arises, “How do we incentivize people to act in line with the new policy?” If we ask the question this way, we are likely to think of a much smaller set of options than if we asked, “How can we motivate people to act in line with the new policy?” The first question leads initially to thoughts of bonuses or benefits offered to individuals. The second question might include these things but also include a media campaign, or workshops with those groups most affected, and so on. We need to recognize that incentives are just one particular kind of motivation. So how do we specify the particular meaning of incentives, incentives in the narrow sense, and distinguish them from other forms of motivation? How might we distinguish incentives from rewards, punishments, and prizes or from wages and compensation, for example? It is certainly true that all of these things can be used to motivate people. But incentives necessarily serve this function, while rewards, punishments, prizes, wages, and compensation do not. People can win prizes without even knowing they were eligible for them. Clearly, in that case, the prize cannot have been a motivator. People who serve on juries in the USA are compensated a small amount, which certainly doesn’t motivate them to serve. Some people would continue to do their work, even if they weren’t paid for it. They aren’t actually motivated by their wages. Moreover, unlike incentives, prizes and rewards must be earned or deserved. They are a recognition of merit. Similar observations apply to the distinction between disincentives and punishments. Punishments can serve as a deterrent, and when they do, they are a disincentive. But punishment can be justly administered when it is deserved, even if it does not serve as a deterrent. Moreover, many disincentives are not punishments—for example, parking meters are a disincentive to drive downtown but certainly not a punishment for doing so. Wages are also an interesting case because they are both a motivator, like an incentive, and earned or deserved, like a reward. Wages are a form of compensation, which means “rendering equal” or a “recompense” or “equivalent.” They are a payment for value received or services rendered. Wages must be earned. So it makes perfect sense to speak of “fair wages.” But there is no such thing as a fair incentive. An incentive is a benefit designed as a motive or inducement to action. The right amount of an incentive is the amount it takes to produce the desired behavior. This is why large executive bonuses look fine to people who see them as incentives and grossly unfair to people who see them as a form of compensation. The former does not need to be earned, while the latter does. A discrete prompt expected to elicit a particular response. An extrinsic benefit or a bonus that is neither the natural or automatic consequence of an action3 nor a deserved reward or compensation. An offer intentionally designed to alter the status quo by motivating a person to choose differently than he or she would be likely to choose in its absence. With this understanding of incentives in mind, I will argue that praise is something quite different. I hope to show not only that praise has quite different characteristics, but that unlike incentives, it has a positive relation to virtue. The desire for praise or approval is a motivation that is essential to the formation of moral character. As I said before, it is unusual to insist that incentives and praise are very different kinds of motivations. Many people think that praise is just one form of incentive. One important source of this mistake is the distinction so prevalent in psychology between extrinsic and intrinsic motivation. Extrinsic motivation happens when the reward for an activity is not part of the activity itself—for example, I give a child some ice cream for doing her homework. Incentives are clearly a form of extrinsic motivation. (See the second item on the list of characteristics of incentives.) Intrinsic motivation happens when the reward is inherent in the activity, when the activity might be done for its own sake—for example, dancing for the pure joy of it. If extrinsic and intrinsic are the only possible types, praise looks a lot like incentives, since both are clearly extrinsic forms of motivation—I can tell the child who did her homework “good job” or I can give her the ice cream. But in fact, praise operates differently from ice cream. Daniel Pink, in his book Drive (2009), makes a distinction between “if–then” motivators and “now-that” motivators which captures the difference between incentives and praise in a way that the “extrinsic–intrinsic” distinction does not. “If–then” motivators are conditional. They set up expectations before a task is attempted. The message is: if you do something for me, then I will do something for you. This is the way incentives work. “Now-that” motivators work differently. They acknowledge a job well done after the task is completed. Now that you have done something well, I will acknowledge your achievement. This is the way that praise usually works. Another way to look at it would be to think of praise as a kind of bridge between extrinsic and intrinsic motivation. Here is an example of what I mean. My children had a kindergarten teacher who made a paper “bookworm” for each child. The bookworm grew longer by one link each time the child finished a book. The bookworm could be considered a kind of praise. It was a concrete form of recognition of the child’s achievement. Of course, this was an extrinsic motivator. I am sure that my children were motivated by the pleasure of watching their bookworm grow and not only by the pleasure of reading a book. But the value of the bookworm was entirely symbolic—it had no meaning other than as a sign of accomplishment and a sign of the value of reading. In fact, it communicated that reading has an intrinsic value. If the teacher had rewarded the children for reading with ice cream, the message might have been quite different. It could communicate the opposite—that the effort of reading needs to be made “worth it” by something else of value because reading has no intrinsic value. Praise is not like ice cream. How does praise work? The child begins by wanting the praise or approval of important adults in her life. But she comes to desire the satisfaction of being praiseworthy in her own eyes. She internalizes the social norms and standards expressed in her relationships with others. Praise is part of a dynamic process that takes place within relationships in a social context. There is a developmental process that begins with extrinsic motivation but becomes something else altogether. In other words, we can begin with the desire to see the bookworm grow and end with the intrinsic motivation of taking pleasure in reading. The desire for social approval or praise is a powerful motivator inherent in the human psyche. This is evident in the definition of the word. Praise (verb) is to express a favorable judgment of someone or something. Praise (noun) is the expression of approval or admiration for someone or something. That standard may be internalized; that is, it becomes part of the person’s self-evaluation. This process takes place through ongoing relationships in a social context. Compare this list of characteristics with the list of characteristics of incentives given above. While praise may sometimes share certain characteristics with incentives, the defining features of praise do not appear to be applicable to incentives. The second item is particularly striking—this may be the most important difference between incentives and praise. Praise always involves an evaluation, a judgment of value. That is part of the definition of praise. Incentives do not do this. For example, if you volunteer to participate in a research study, I might praise you for your dedication to science, and my admiration would indicate the value I place on your action. But if I offer you an incentive for research participation, there is no implication that what you are doing is any more or less praiseworthy than working in a grocery store or anywhere else. Praise and incentives send different kinds of messages. The four elements of the dynamics of praise listed above are clearly described in John Locke’s Some Thoughts Concerning Education (1996b) and Adam Smith’s Theory of Moral Sentiments (1985), as well as in contemporary psychology. There is remarkable agreement. Each of these treatments of praise illustrates the relation between praise as a motivator and the development of morality. Note that Locke’s preferred terms are praise, commendation, and esteem; Smith uses praise but also approbation; and the contemporary literature uses praise, affirmation, and approval. There are subtle, important, and interesting differences between these terms, but it suffices for the discussion that follows to use them interchangeably. John Locke wrote advice for his friend, Edward Clarke, on how to raise his son and later published these writings with the title, Some Thoughts Concerning Education (1996b). In this work, Locke directly addresses the main question under consideration here. He asks, which is a better method of cultivating virtue in children—incentives and disincentives, which he calls rewards and punishment, or praise and blame? His response is unequivocal. According to Locke, virtue is the ability to deny ourselves the satisfaction of our desires and follow where reason leads instead. It is the capacity for self-denial or self-control. If you give a child incentives or rewards for particular behaviors or tasks, all you do is make matters worse. You “authorize his love of pleasure (par. 52).” You only encourage his desires for money or treats or other indulgences, such as ice cream. Incentives can do many things, but they cannot teach self-discipline. This is a very important point. Locke recommends praise and blame instead. He writes: “children (earlier perhaps than we think) are very sensible of praise and commendation (par. 57).” This is easily observed. I was recently watching a ten-month-old baby sitting on the ground at his mother’s feet, picking up things from the ground and putting them in his mouth. You could see his eyes scanning his mother’s face to see what her reaction would be as he reached for something. He was clearly testing what she would approve or disapprove. The mother and child managed to engage in quite a lot of communication without either one saying a word. Adults are also very concerned about the approval or disapproval of others. According to Locke, in his Essay Concerning Human Understanding, the law of opinion or reputation is stronger in governing people’s behavior than either the civil law or the Divine Law (1996a, 2.28.12). Human beings care a great deal about the good opinion of those around them throughout life. With children, the desire for esteem and the fear of disgrace motivate them to meet their parents’ expectations willingly. Moreover, in coming to value the good opinion of others, children will emulate people who are generally admired. They will begin to conform their behavior to society’s standards of virtue on their own. In other words, they will internalize the standards. Teach him to get a mastery over his inclinations and submit his appetite to reason [remember that this is virtue, according to Locke]… To bring a young man to this, I know nothing which so much contributes as the love of praise and commendation… make his mind as sensible of credit and shame as may be and when you have done that, you have put a principle into him which will influence his actions when you are not by … (1996b, par. 200, my emphasis). Locke’s account highlights all four of the elements of praise as a motivator identified earlier: people desire praise, learn what is considered praiseworthy, and internalize those standards in the context of their relations with others. Locke argues for a decisive difference between incentives and praise in their relation to the development of morality. If virtue is your aim, and virtue requires self-control, incentives are counterproductive. Praise is the proper foundation for an education to virtue. Adam Smith describes a very similar dynamic in his discussion of praise in the Theory of Moral Sentiments (1985), but not in the context of childhood education. He also believes that the desire for praise is natural, and so is the desire to be praiseworthy. Where does the standard for praiseworthiness come from? It comes from living in society. Society is the mirror in which we come to see and judge our behavior in the eyes of others. Just as we would not be able to judge our appearance if we lived on a desert island and never saw other human beings, we can only judge our conduct by experiencing what is approved and disapproved by others in society (110). Through these experiences, each of us develops an internal judge—Smith calls it “the impartial spectator”—that allows us to evaluate our own behavior. We want to be the person our internal impartial spectator would approve. There is a dynamic process by which we move from desiring praise from others to desiring self-approbation. And this is where Smith makes the connection between praise and virtue. He writes: “love of self-approbation is love of virtue (117).” And, “No action can be called virtuous which is not accompanied by the sentiment of self-approbation (178).” This might seem a little odd. We are accustomed to thinking of virtue as action motivated by concern for others, or altruism, rather than by self-concern. But Smith suggests that the requirements of virtue can be satisfied by a certain kind of self-concern. When we act from the desire to live up to our own ideals, to have a clear conscience and think well of ourselves, we act virtuously. In contemporary language we might say that ethical behavior is motivated by the desire to maintain our self-esteem and that the standards for self-evaluation begin with praise from others. In short, the same four elements of the dynamics of praise that I have identified in Locke’s account are present in Smith’s account as well. It should come as no surprise that the same elements can also be found in contemporary psychology. Of course, there are many competing schools of thought in the psychology literature and heated arguments persist over the relative efficacy of incentives and other forms of motivation. I am not trying to choose sides in that fight here. I am trying to show that incentives are not the only form of motivation and that other forms, praise in particular, have a different relationship to morality. In the contemporary psychological accounts, despite their differences, it would be widely accepted that certain forms of praise are appropriate and that praise can play a crucial role in developing moral capacity. Children are sensitive to praise and blame and internalize the standards for behavior that praise and blame communicate as they become self-regulating adults. I am not so convinced that this is an easy transition. How does a person who spent his childhood so dependent on the approval of others ever develop the particular virtue of moral courage—the ability to stand against the crowd for what is right? This is the sort of question that only will arise once praise becomes a subject of inquiry distinct from incentives. Let me be clear here that I am not arguing that praise is always preferable to incentives as a motivator. There are all kinds of situations in which incentives would be the better choice. And in many situations, there is no “either-or” choice to begin with. In fact, there is some suggestive research which shows that classroom incentives work best when combined with teachers who are affirming and supportive (Deci et al. 1981). I am only trying to argue that, first, incentives and praise are not the same kind of motivators. To classify them both as extrinsic motivations, and leave it at that, obscures the crucial differences between them. And second, these differences include the fact that praise and incentives do not have the same relation to moral norms. While incentives can undermine moral motivations, praise is essential for their development. Moreover, praise and blame not only govern the process whereby we internalize social norms, they act as enforcers of those norms, since internalization is never complete. In this regard, the studies showing that people are more likely to wash their hands in a public restroom if other people are present are quite suggestive (Pickering et al. 2014). We need actual spectators, as well as internal impartial spectators. 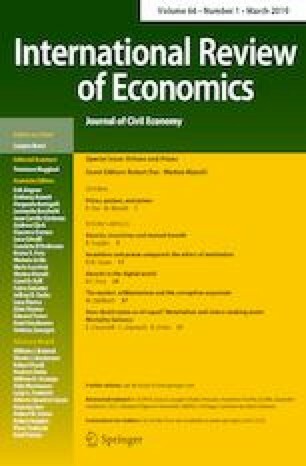 What are the implications of this analysis for economic thinking in particular? The analysis leads in the same direction as George Akerlof and Rachel Kranton’s, Identity Economics, published in 2010. In that work, they posit two different types of motivation: incentives and identity. Identity is similar to the ego-ideal, the impartial spectator, or the internalized voice of social norms that I have been talking about as arising from the powerful desire for praise. Akerlof and Kranton point out that economists have been focused on how individual tastes or preferences determine choices given certain incentives and how behavior can be changed by altering incentives. What is missing here, according to them, is an understanding of the ways that identity shapes choices and how social norms and institutional cultures shape behavior in interaction with identity. For example, consider workers in an organization. Individual incentives offered to the workers operate by influencing each individual’s calculation of his own advantage. Identifying with the organization, on the other hand, can lead them to comply with the organization’s norms independently of incentive motivations. If we think only in terms of individual incentives, we will miss all sorts of potential solutions to current problems as well as misunderstand what those problems are. For example, suppose we are interested in encouraging police officers to report misconduct by their fellow officers. We could offer a large cash bonus and protection from retaliation for whistleblowing. But we might well find ourselves disappointed. It is likely that the bonus and the protection will be outweighed by the unwritten institutional norm called the Code of Silence. This code is part of the officer’s sense of who he is, his identity—he will say to himself: “I am not the sort of person who betrays my friends.” And that consideration may far outweigh the whistleblowing incentives. To tackle this sort of problem requires not only considering individual preferences, but also addressing what sorts of behavior are approved or disapproved, praised, or blamed, within a particular institutional and social context. As this example shows, the norms and standards that we adopt in seeking the approval of others may not always be norms and standards that are defensible. This is one of the complications identified above that arises when considering the dynamics of praise. And it remains invisible if praise and incentives are not clearly differentiated from one another. Incentives and praise are both motivators, but they are not alike. They have different psychological dynamics, and they have different relationships to virtue. To the extent that virtue requires self-denial, incentives can undermine virtue. This is because incentives motivate by promising the satisfaction of desires. More importantly, praise communicates a standard for evaluation or judgment—incentives do not. And so, incentives cannot play a role in the internalization of standards. That role is reserved for praise. These differences between incentives and praise have been underappreciated in part because of the psychological assumptions that have governed the discussion. It is time to move beyond the extrinsic motivation/intrinsic motivation dichotomy. And it is time to move beyond the simplistic assumptions of behaviorism to embrace a richer psychology of motivation. This section relies heavily on Grant (2012), chapters 2 and 3. The graphs of frequency of word usage in this paper were produced using Google Ngrams. On the changing meaning of the term, see the essay by Robert Sugden in this volume. If I tell you to eat apples because they will make you healthy, I am appealing to the natural or automatic consequence of eating apples. I am giving you a reason to eat them. If I tell you that I will give you a dollar every time you eat an apple, I am offering you an incentive. Prizes are a form of praise in this respect.